I love the eggplant-y color of On a Trip, I'm surprised I haven't used it more! These are really cute! I love the lavender shade! By the way, lacquerbeanz is cute! The purple polish looks beautiful on your nails! And the aztec detail looks also just perfect! And I love the look of the purple matted. 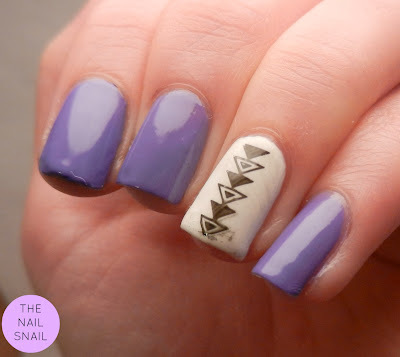 Wow, the triangles are so exact, so jealous you can do that!